One of the most challenging endeavors for thought leaders in large organizations is to drive actual innovation and technological adoption. The reasons for this are plentiful and include: funding processes, committee obstruction, risk aversion, established investment in older systems/processes, and organizational cultural resistance. These are barriers to innovation in virtually every established, large organization in both the private and public sectors. These barriers sometimes serve the good by protecting the organization from making costly mistakes, but they also sometimes prevent organizations from achieving great gains in productivity. What follows is a great example from an organization that has learned to adopt transformative new technology while simultaneously managing risk to avoid costly mistakes. 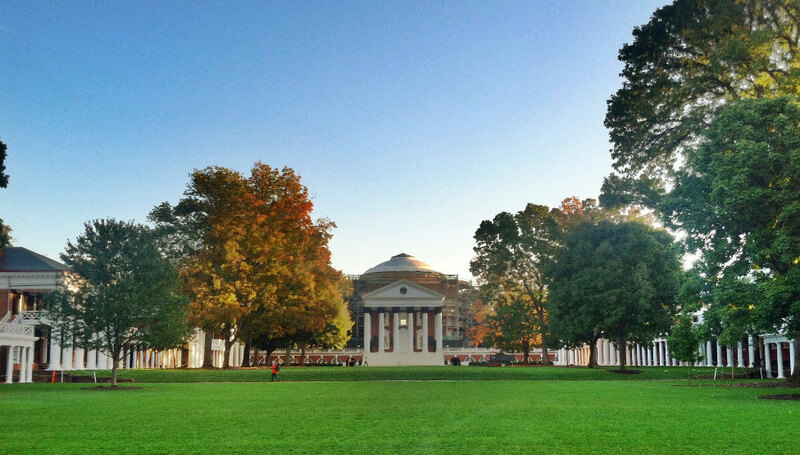 The University of Virginia (UVA) is one of the oldest academic institutions in America and is also one of the most respected for academics and research. UVA lives and breathes excellence, and it shows in their facility management processes—including their adoption methods for innovation and new technology. I tend to believe success in innovative solutions is only limited by our appetite for risk. The trouble is, in the utility business, risk has to be mitigated. Find low-risk ways to test new technology. In our case it was a trial run on a single chiller which was low-cost and low operational risk. The UVA Facilities team’s approach to technology evaluation is thorough and involves all the expertise of functional areas within the organization affected by the technology. Here again lies the potential value of the new technology proposal. Unfortunately, some new technology products don’t perform as well as the sales and marketing materials state. This reality sadly causes many organizations to forego new improvements in order to avoid the risk of non-performing investments into efficiency projects. At UVA, risk management is well-employed to ensure substantive opportunities to provide more value to the total organization are not lost. The team worked within the risk management requirements of UVA to find a way to validate the ATCS technology benefits within the chiller plants. The first system, after fully vetted, was provided as a risk-free trial to the University with the University completing the installation. 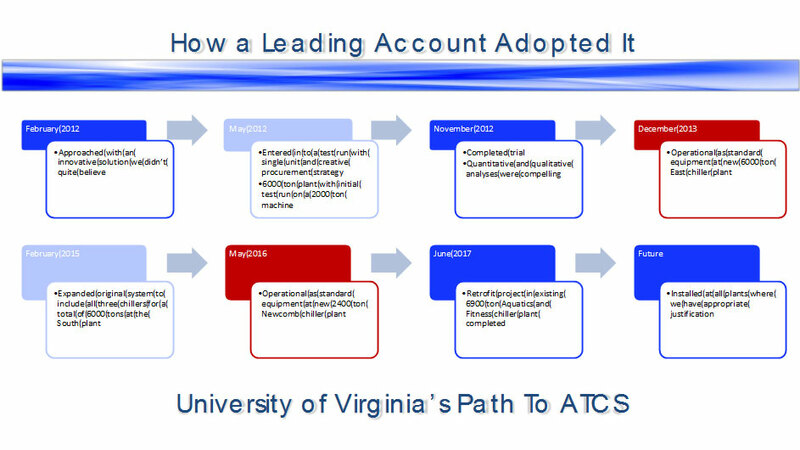 The trial agreement was structured such that if the system worked as advertised by eliminating heat exchanger fouling, then UVA would purchase the ATCS after the first year of operation. In the interim, the system was monitored by all parties to measure and evaluate its continuous operation and performance at improving chiller efficiency. At the completion of the first year of operation, the ATCS equipment had performed reliably and per specification. Additionally, chiller data results were promising compared to other non-ATCS-equipped chillers, but in UVA’s case, the final factor was the high degree of cleanliness in the tubes of the ATCS-treated chiller. Good qualitative and quantitative data proved the ATCS acquisition was a wise, beneficial, and value-enhancing move for UVA’s chiller plant organization. The real story of UVA’s adoption of the process is not one of adopting a new system that provided value, rather it is how the organization adopted a new way of viewing chiller efficiency and cleanliness in its entire organization. The first trial was simply a beginning for the learning organization and it used the lessons of the trial to improve chiller efficiency across its entire enterprise. Also, automatic chiller fouling prevention supports the University’s commitment to Green Cleaning by eliminating manual tube cleaning that often involves caustic chemicals. To date, UVA has installed over 15 automatic tube cleaning systems on chillers providing almost 30,000 tons of cooling. The automatic tube cleaning systems are saving energy, reducing workload, improving capacity and performance and significantly contributing to UVA’s sustainability commitment. In fact, installation of Innovas Technologies’ Helios Tube Cleaning System® has become the operational standard for chillers at UVA. Deeper within the lesson is how UVA used its innovation adoption process to evaluate and select an investment that would add value to the university, improve the work process for the involved employees, and open the door for new innovative thinking regarding other initiatives. Then, after the initial adoption, to implement the successful innovation throughout the organization where it can improve its performance. The following is a flow diagram charting how UVA grew the initial evaluation into a facility-wide value generator. UVA’s risk-management system for technology adoption is designed to leverage new technology and processes to improve the way the university operates. UVA Facilities is managing process change and technology adoption in a way that mitigates risks and maximizes employee support for change. As a result, UVA is quietly becoming a key leader in facilities management excellence. This point is accentuated when one looks at the efficient operation of the UVA chilled water plants where the Helios Tube Cleaning System® plays a headlining role.